(SCD LEGAL) Vitamin D is inadequate in many individuals and daily need appears to be higher than previously thought. Vitamin D’s role in calcium metabolism and bone health is well known. However, it has many other important physiologic roles that are not as well appreciated. Vitamin D receptors are widely distributed in the body, including colon, prostate, breast and ovary, where it acts to inhibits the excessive growth of body cells and tissues and helps cells mature normally. Adequate amounts of vitamin D, an essential, fat-soluble vitamin, come from consistent exposure to sunshine and are difficult to obtain from dietary sources. Postmenopausal women, older individuals, and those with malabsorption, limited sun exposure, or certain illnesses may need higher intakes of vitamin D. Vitamin D3, the naturally-occurring form, is supplied in high-potency amount of 1,000 I.U. per capsule for those needing to conveniently augment dietary intake. A daily vitamin D3 intake of 1,000 to 2,000 units, an amount shown to be safe and effective by clinical studies, is now advised by many experts. 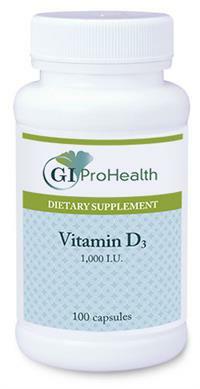 Click here for Supplement Fact for Vitamin D3 1000 I.U. Click here for Supplement Facts for Vitamin D3 5000 I.U.